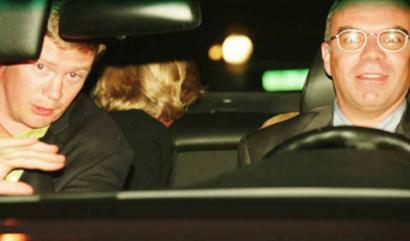 LONDON - A photograph captures the scene inside the car minutes before the crash that killed Princess Diana. The driver has a glazed look as a bodyguard tries to wave away pursuing paparazzi. Diana's head is turned away, toward the back windshield. This and other fleeting images are giving a coroner's jury a picture of the last hours of the princess and her boyfriend Dodi Fayed - hours filled with shopping for a ring, vainly seeking privacy and finally dying as they fled from the paparazzi. Yesterday, inquest jurors saw security camera videos of the couple arriving at the Ritz Hotel on Aug. 30, 1997. The images show Fayed leaving for a short car ride across the Place Vendome to Repossi jewelers, then returning a short time later with a brochure. Ritz executive Claude Roulet is seen with what was described as a bag of rings from Repossi's "dis moi oui" (tell me yes) line. Whether Diana and Fayed planned to announce their engagement the next day is one of the questions before the jury, as is the claim that she was pregnant with Fayed's child. Fayed's father, Mohamed al Fayed has made those claims and is insisting that the couple were victims of an Establishment plot directed by Prince Philip, the queen's husband. Shots of two people standing in an elevator may tell you nothing about how they came to die in a car crash hours later. But the images of photographers swarming around their car during the day help explain the apparently hasty change of plans that led the couple to flee from the rear entrance of the hotel shortly after midnight. The videos shown to the jury were taken from 31 of the 43 security cameras at the Ritz, said Inspector Paul Carpenter, who was part of Metropolitan Police investigative team headed by former chief John Stevens. That team laid the blame for the crash on driver Henri Paul, concluding that he was far over the legal limit for alcohol and driving too fast. Paul also died in the crash. Two photos shown to the inquest on Tuesday, taken by French photographer Jacques Langevin, apparently are the last taken of Diana before the crash - though only her hair is visible. The time is 12:20 a.m. on Aug. 31, 1997. About 10 minutes later the Mercedes had slammed into a pillar in the Pont d'Alma tunnel. Langevin was prosecuted for invasion of privacy for taking two photos of the couple leaving the Ritz, and he and two other photographers faced the same charge for taking pictures of the car shortly after it crashed. Langevin was acquitted of the charge involving the Ritz photos. Following a series of appeals, Langevin, Christian Martinez, and Fabrice Chassery were fined $1.42 each by a Paris appeals court for the tunnel photos.